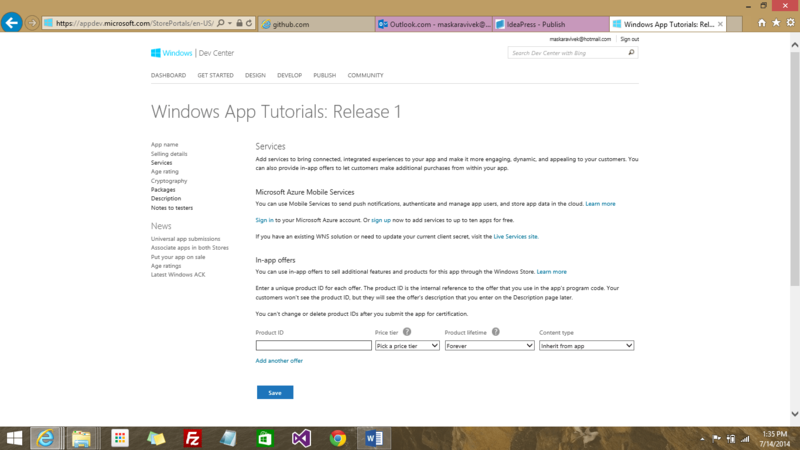 If you find it tricky to submit a Windows 8 app for certification, then this tutorial is for you. Bookmark it for reference while submitting an app to the Windows 8 store. You will need a publisher account before you could submit any app to the marketplace. Windows dev center’s annual fee is very less as compared to other platforms and if you already have a Windows Phone dev center account then you don’t need to pay again. Your new Windows 8 account will be linked with the Window Phone account if you are using the same email address. Here’s how you could submit an app to store. In this tutorial I will be using the same app which we creating using IdeaPress for Windows 8. Have a look at this blog post to see how we created an app from our WordPress website using IdeaPress for free and generated the Visual Studio package. Right click on the project name in solution explorer, go to Store> Associate app with the Windows Store. You will be prompted to log in the Microsoft account with which your publisher account is linked. After login the dialog box will list the project which don’t have any packages added to them from Windows Phone and Windows 8 dev center combined. You could also reserve a new app name. Reserve a new app name if it’s a new app and is not already published for Windows Phone. Here I choose to select one of the existing app names as Windows App tutorials was already published to windows phone and I wish to use the same identity for Windows 8. Choosing an existing app name will let you make your app universal as they both will share the same identity in the store. Go to Store> Create App Packages by right clicking on the project name. You would be prompted to login and in the next step it will ask whether you want to build packages to upload to the Windows Store. Choose yes and click on Next. Next step will ask you for output location, version number and solution configuration mappings. The default settings work well and you could now click on Create to build the APPX file. Next it will ask you if you wish to run the App Certification Kit. It is recommended to let it run all the tests and check for any possible errors. Better invest some time now to save the frustration of your app not getting certified after submission. Go to store> Take Screen shots to take screen shots of various screens of the app. These would be required during submission. After login choose Submit an app from your dashboard to start submitting an app for Windows 8. The app submission screen shows various sections that needs to be completed in order to submit an app. It’s a little tedious but it can’t be helped! In this section you need to enter the name for your app. If you are using an existing name then you could use if from the list or else reserve a new name for your app. You could use an existing app name if your app already exists in the Windows 8/Windows Phone store. This step lets you choose the price and market for your app. Choose your preferred price from the list and select the markets to which you wish to publish the app. Here I am choosing all markets as I am sure that it won’t violate any content compliances. Also scroll down to choose the app category and release date. If your app makes use of any services like azure mobile services or in app purchases then fill in those details. We just click on save the default settings. This step lets you choose an age rating for your app. If you wish to avoid uploading any rating certificates to your app then it is safe to choose `12 and older`. Otherwise you need to add the appropriate certificates with the app. This step asks for how your app uses cryptography and encryption. We don’t make uses of any encryption so we choose the appropriate options and move ahead. Locate the APPX file in your project and choose to upload it here. After uploading it will verify if the uploaded package has valid identity. Save it and move to the next step. Add the description, features, keywords and screenshots for your app. It lets you add different details for Windows 8.1 and Window 8. That’s all which is needed to submit an app. Now keep waiting till your app gets certified. It usually takes less than one day to get an app certified.